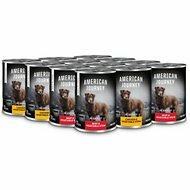 Feed your pup’s wild side with the Walk About Kangaroo, Sweet Potato & Green Beans Canned Dog Food. Formulated with 100% Australian kangaroo as the first ingredient plus green beans and sweet potatoes, it’s packed with muscle-building protein and whole-food antioxidants. Loaded with amino acids, vitamins, minerals and fish oil-sourced omega-3 and 6 fatty acids for a healthy skin and coat, it provides a balanced and complete diet for dogs of all breeds and ages. It’s highly-digestible so it’s easy on sensitive tummies, and can be served on its own or as a tasty kibble topper. Made with 100% Australian kangaroo as the first ingredient so it’s packed with protein for healthy muscles and clean energy. 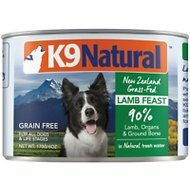 Single protein source so it’s great for dogs on limited ingredient diets or with allergies or food sensitivities. Formulated with veggies like green beans and sweet potatoes, plus vitamins, minerals and antioxidants for a complete and balanced diet. Great for dogs of all breeds and ages, and is high in omega-3 and 6 fatty acids for skin and coat health. Highly-digestible so it won’t upset sensitive tummies and contains no grains, fillers, artificial colors, flavors or preservatives. Please Note: Sale of this product is restricted in California. 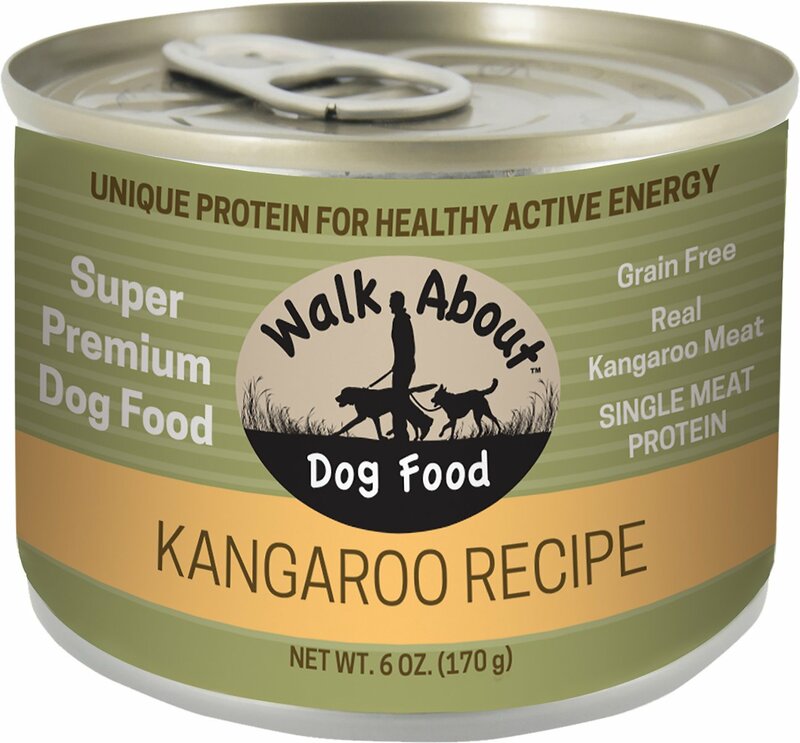 Kangaroo, Kangaroo Broth, Liver, Sweet Potatoes, Peas, Green Beans, Dicalcium Phosphate, Fish Oil, Guar Gum, Calcium Carbonate, Salt, Choline Chloride, Potassium Chloride, Cassia Gum, Zinc Proteinate, Vitamin E Supplement, L-Ascorbyl-2-Polyphosphate (Source of Vitamin C), Ferrous Sulfate, Zinc Sulfate, Iron Proteinate, Copper Proteinate, Thiamine Mononitrate, Selenium Yeast, Niacin Supplement, d-Calcium Pantothenate, Vitamin A Supplement, Manganese Sulfate, Riboflavin Supplement, Manganese Proteinate, Vitamin D3 Supplement, Vitamin B12, Pyridoxine Hydrochloride, Calcium Iodate, Folic Acid. The thing I really like about this food is I can see the REAL food ingredients when I open the can. I can see real peas, real sweet potato and it has a slight fish smell due to the fish oil can says is inside. I do wish they named the type of fish from which the oil came. Also, its not super watery so doesn't leave me with the impression that I bought a can of water like some wet foods. Fairly dense consistency. And my pup seems to really like it. Oh I also like that its baseline contents are the same as the quail version that I also use except for the protein (single source). Makes it easy to feed two different foods each day w/o GI upset. Kangaroo in the PM and quail in the AM! All the Walk About pet foods are great quality foods. 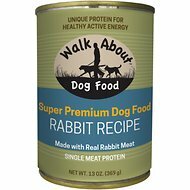 I was so happy to find these unique, and very healthy proteins and foods for my dog who has several food allergies. As it's very difficult to find foods with good proteins and good ingredients that do not contain any legumes or chicken! So far she's eaten the wild boar, the quail and the kangaroo. She loves them all. My 15 year old loves this food. She has severe allergies and I love the ingredients. She has not had a scratching, itching episode since she started eating this dog food. Our dog loves the Kangaroo recipe by Walk About. This is by far his favorite food. I like that it's single protein and low fat. It has a thick consistency and pleasant smell. I will continue to purchase..
My pug Otto has food and environmental allergies. He's been eating hydrolyzed protein food, which is disgusting -- faux food with cellulose! I've been looking for a low fat alternative protein food and this seemed to be perfect. It has a gamy, real food smell, which Otto loves. Our four dogs thought this was amazing. They got a bit mixed in with their kibble and ate it like it was the best stuff on earth. Would recommend it. I purchased my first case recently, as my 9 year old chiweinie has terrible allergies and she loves it. I have decided to feed it to my other dog as well. Though it is expensive, I am hoping it will do the trick. My cat loves it too! Bought this to try with my girls. I liked the amount of protein and the lesser amount of carb/fat in it. They liked it. Fantastic Product. My dogs absolutely love it, even my picky eater. Also helps with controlling my dogs allergies. Best product ever. Keep selling this product.